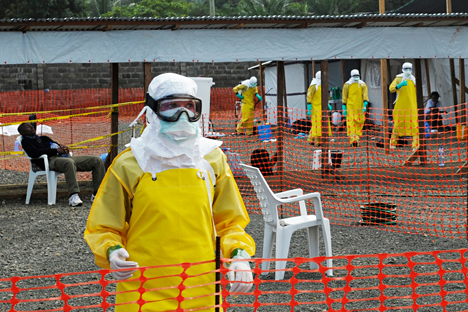 Russia has developed two vaccines against the Ebola fever. Russian Health Minister Veronika Skvortsova said that Russia is ready to reach the output of vaccines against Ebola by batches of 10,000 doses monthly and launch a vaccination in Guinea already by March. "Preparations are being produced, now they are produced in the basic concentration which is needed for clinical tests, but we have scaled up this production in 2015. We can reach quite large batches, up to 10,000 ampoules, doses monthly," Skvortsova told reporters on Jan. 14. As Guinea has already filed a bid for the Russian vaccine, it can be brought to the country already by March, the minister said. "We are fully ready, we are ready to launch a vaccination in Guinea in March-April," Skvortsova said. The health minister spoke of new vaccines. Two vaccines have been created: the first one is universal and enables to completely neutralize the virus, "at the same time in a very low concentration," she said. The second vaccine is especially designed for HIV-infected people. "This second vaccine is extremely important, primarily for African countries, where the HIV infection rate is absolutely different. And for other countries as well," Skvortsova said.